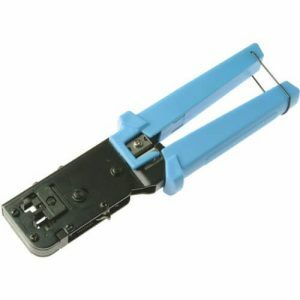 If you are running an IT company, working as a professional technician in the networking field, or even a DIY enthusiast who love to do all the handy tasks by own, then you need an RJ45 crimper tool. 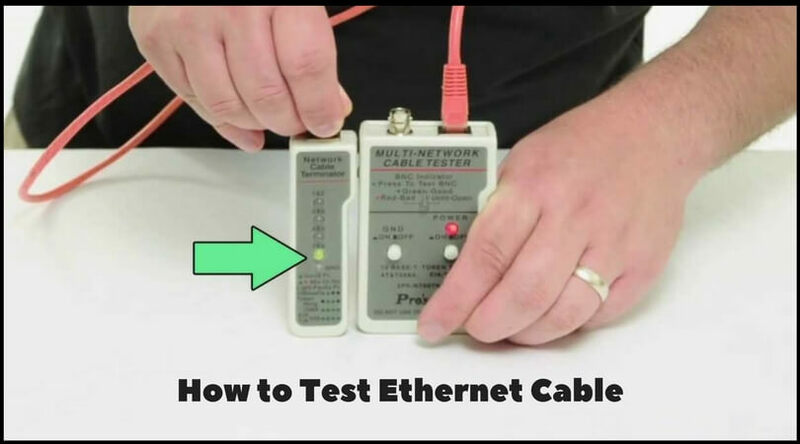 The primary use of an Ethernet crimping tool is to crimp the Cat Ethernet cables for getting perfect internet connection and relief from frying wires. Today, I will provide you a list of the most sought and best RJ45 crimp tools which are tested by the experts. 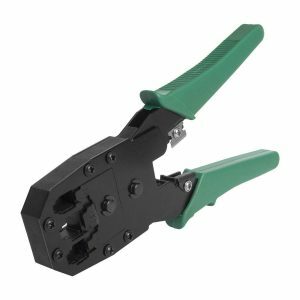 Is there a need to buy an Ethernet crimping tool? If you have a friend who allows you to borrow the crimp tool whenever you need it, then it’s okay if you not buy it personally. But, you may not like to bother your friend frequently to setup the network connection in your home or office. So, it’s better to buy an RJ45 crimper. 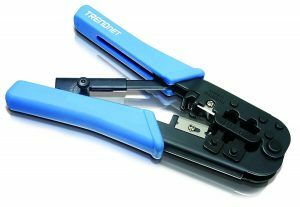 The best Ethernet crimping tool can cut, strip, and crease the connectors to have a perfect connection. Such tool helps you to make a proper management of the network cables and gain more productive and helpful working of the devices attached to them. Let’s have a look at the list of the top networking tools now. The TC-CT68 from TRENDnet is the best Ethernet crimping tool available in the market today. It is affordable, easy-to-use, and can handle various types of connections. You need to be very careful while stripping the Ethernet cables, especially Cat5 and Cat6. Otherwise, you may end with a cut on them. Also, the handles can become a problem while storing this crimp tool in a tight space. From professionals to home users, all can have a safe, easy, and quick crimping, stripping, cutting operation on the networking components with the help of the TRENDnet TC-CT68 Ethernet tool. It is a real value for money product. What do you think of getting a whole networking toolkit at a price of a single crimp tool? Well, it sounds fantastic. 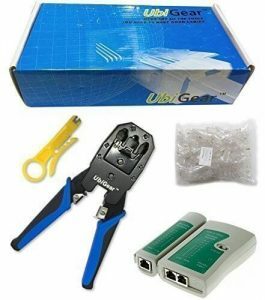 If you are a professional in a cable company, then I recommend you to go with the UbiGear networking toolkit which is available at cheap rate. As the price is cheap, sometimes the quality of the tools may not be found competent enough as expected. The improper line up of slot pins may make your assembly task time consuming and annoying. For the number of tools you get and the price you have to pay, this network toolset from UbiGear is a fair choice. Even if you make wrong wirings with the connectors, you will have a plenty of RJ45 connectors in stock to replace them. The Clamshell EZ-RJPRO is a top-class RJ45 crimp tool that offers you to make secure and ultra-solid network across your various devices. It will help you to get rid of every connectivity obstacles like handling the large gauged cables and hard & thick conductors. It is compatible with all the standard connectors and modular plugs. The crimping tool may not satisfy the 1/8 wire cutting problem. Some users complained that the instrument arrived in a defective design which created issues with alignments. So make sure to check it on arrival. If you have no problem with the budget, then you should get this one of the easiest and quickest Ethernet crimping tools from Platinum Tools. Klein Tools designed this most reliable and fast tool for your network applications. The VDV226-011-SEN is a three in one tool which works as a crimper, stripper, and cutter. If you don’t stay precise while using, it may cut the wires deep and can leave a minor damage. Also, you may get a low-quality tool if you don’t purchase from a reputed site as there are many clones made of this popular product from Klein Tools. I am using this tool in my workspace and liked the way it operates. I don’t have any issue at any time and may use it for a few years more. If you are looking for an affordable, sturdy, easy-to-operate, and three-in-one tool, then the VDV226-011-SEN is the right option to choose. If you are looking for a specially designed crimper for RJ45 connectors and a plier for Cat5 Ethernet cables, then check out this LAN tool from NYKKOLA. It does not act like a stripper. So if you want to strip the Ethernet cables, then you need to purchase a separate tool. If you want a simple yet effective RJ45 crimper at a cheap price, then get this NYKKOLA network cable tool. But, if you prefer a more reliable, multi-tasking, and sturdy tool, then look for other options here. Again, from Platinum Tools, you get a trimming and crimping tool with a durable design and affordable price. 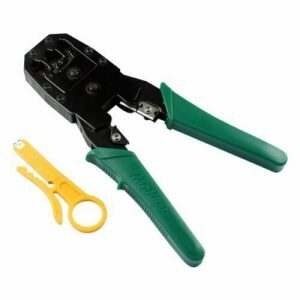 This EZ-RJ45 is a well-built crimper that uses only one easy operation to trim and crimp the Ethernet cable connectors. Sometimes you may feel that the pressure of the crimper is not enough on the copper connectors, which leads into improper contact to the wires. Also, it may not work correctly on stranded and solid core Ethernets. 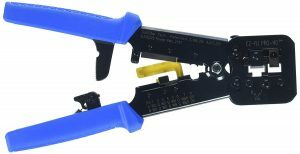 Though the EZ-RJ45 crimper from Platinum Tools lacks some strength to perform heavy duty operations, it can turn to be a good choice for crimping the RJ45 and other Ethernet connectors. 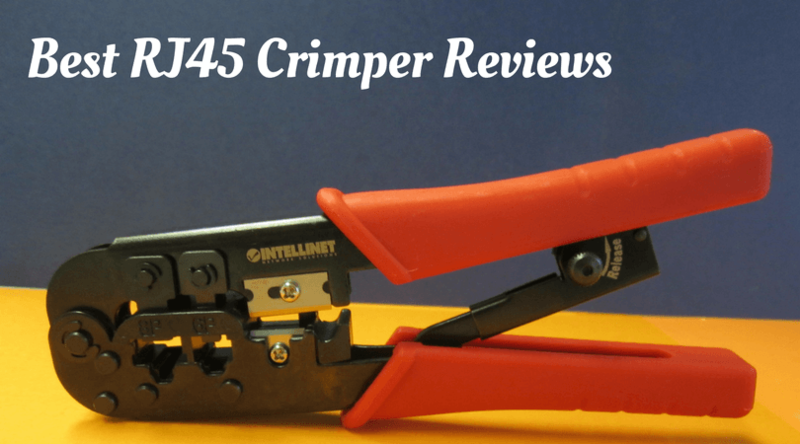 This all-new RJ45 crimping and plier tools from YOOMALL are not as popular as other top branded crimpers, but it surely has a good image amongst the non-professionals. These instruments are designed explicitly for RJ45 and Cat5 Ethernet networks. So if you are dealing with such type of connections, then bring them home. It is not made for professional use, so if you have a daily need of a crimper, don’t buy this. The RJ45 crimping and plier tools from YOOMALL are perfect for Cat5 networking connections as they have some specific design. But, for the IT professionals, it’s not recommended to buy them as they are not meant for longer & frequent use. 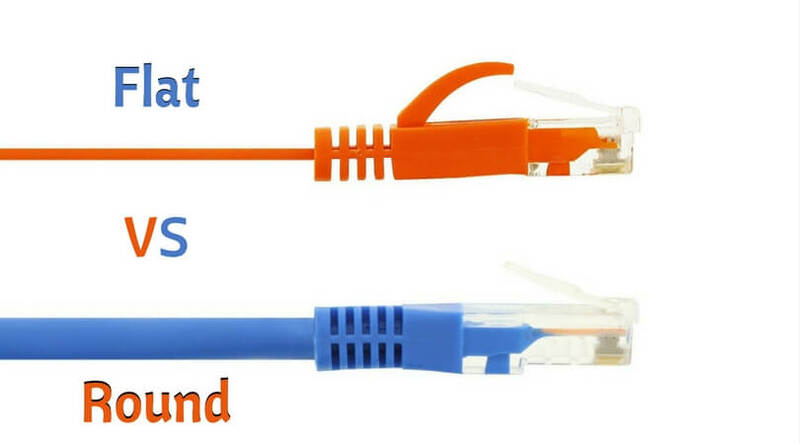 If you are working with networking wires at home or office, daily or occasionally, heavy duty or softer cycles; the best RJ45 crimper will help you to have the best connection between the connectors and Ethernet cables. Almost all the RJ45 crimping tools come in lightweight designs, made for durable operations, and are available at affordable prices. The best Ethernet crimp tools will serve you for years if you keep them properly and make regular maintenance of them. Let me know in the comment section below for your favorite RJ45 crimping tool from the list above and how it helped you to make your internet network connection.